For people in King Island, Furneaux Islands, North West Coast and parts of Western, North East, Central North and Central Plateau Forecast Districts. Issued at 2:43 pm Friday, 14 September 2018. 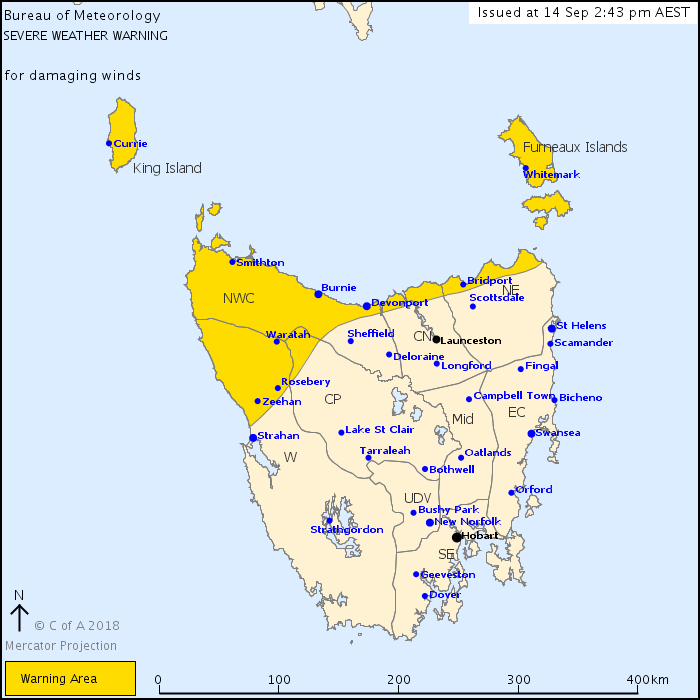 Weather Situation: A developing low pressure system is expected to cross Tasmania during Saturday, bringing strong and gusty winds about the north and northwest of the state. DAMAGING WEST TO SOUTHWESTERLY WINDS, averaging 60 to 70 km/h with peak gusts of 100 to 110 km/h are possible about the Bass Strait islands, the northwest of the state, and the north coast from midday Saturday. Please be aware that the development of the low pressure system is providing some uncertainty with the exact timing and strength of the winds expected. Winds are expected to become cold southwesterly and ease slightly from the west during the evening, though winds will remain fresh and gusty overnight. Locations which may be affected include Devonport, Burnie, Currie, Smithton, Whitemark and Zeehan.